Seán Hewitt read English at the University of Cambridge, where he received his college’s Emily Davies and Lilias Sophia Ashworth Hallett scholarships and twice received the Charity Reeves Prize in English. He completed his Ph.D., ‘J.M. Synge, Modernism, and Political Protest’, at the University of Liverpool, where his research was funded by the Arts and Humanities Research Council, U.K. He is currently revising his thesis into a monograph, and working on a new postdoctoral project, ‘Natural History and the Irish Revival’, funded by the Leverhulme Trust. Seán also works as a poet. In 2014, he was awarded Arts Council England funding for a series of poems, and in 2015 was selected as one of the Poetry Trust’s Aldeburgh Eight. He won a Northern Writers' Award in 2016. 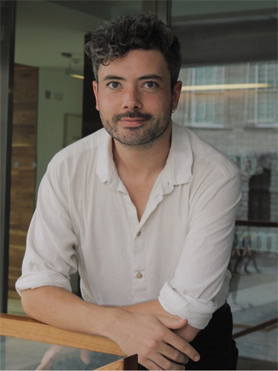 In 2017, Seán won the Resurgence Prize, which ranks amongst the most prestigious of any English language single poem award. His poetry has been published widely, most notably in POETRY (Chicago), The Poetry Review and The New Statesman. He is a regular reviewer for both The Irish Times and Poetry Ireland Review, and has reviewed fiction for The New Statesman. Seán has been invited to speak at the Cambridge Group for Irish Studies, the John Hewitt Summer School and the Institute for Advanced Study, University of London, and was a visiting research fellow at the Willson Center for Humanities and Arts, University of Georgia, in 2017. He has taught on both graduate and undergraduate courses at the University of Cambridge, University of Liverpool, Liverpool John Moores University (where he was Lecturer in Poetry in 2016), and Goldsmiths College, University of London. He has supervised dissertations on Virginia Woolf, W.B. Yeats, J.M. Synge, and Sean O’Casey, as well as Masters’ theses on queer performance and theatre studies. ‘Writing and Evolutionary Theory’, in Oxford Bibliographies in British and Irish Literature, ed. Andrew Hadfield (New York: Oxford University Press, February 2019).